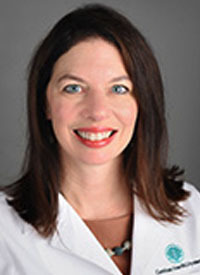 While guidelines encourage physicians to offer genetic counseling and testing to all patients diagnosed with epithelial ovari- an, fallopian tube, and peritoneal cancers, further education will take these recommendations from paper to practice, according to Jubilee Brown, MD, a professor of gynecologic oncology at Levine Cancer Institute, Carolinas Health System/Atrium Health. It is a valuable asset to detect hereditary mutations through genetic testing in those at risk for developing ovarian cancer and those diagnosed with it, added Brown. In an interview during the 2018 OncLive® State of the Science SummitTM on Ovarian Cancer, Brown explained the value of genetic testing for patients predisposed to and diagnosed with ovarian cancer. OncLive®: What is the importance of genetic testing in ovarian cancer? Brown: Genetic testing in ovarian cancer is a very important concept for a number of reasons. By detecting women with hereditary mutations, we can identify those who are at risk for developing ovarian cancer and intervene to prevent them from ever getting the disease. If we can identify them, [we can reduce their risk of developing ovarian cancer] by 95%. For patients who have ovarian cancer, it’s important to do genetic testing for 2 reasons. One is that we can identify their family members who might be at risk and prevent them from ever getting ovarian cancer. Second, we have targeted therapies that act specif- ically on those mutations. We now have this entirely new class of drugs, called PARP inhibitors, that are especially useful for women with BRCA and other related mutations. Has testing become more widespread? It has not become widespread enough, unfortunately. In 2014, the Society of Gynecologic Oncology put out guidelines stating that all women with ovarian cancer should undergo genetic testing. That has helped. The media has actually helped tremendously. When [ac- tress] Angelina Jolie came forward and said that she had testing, there was a big uptake. Also, the lay press [has helped]. If you pick up a magazine in the grocery store, you’re going to hear about genetic testing or read about genetic testing; that’s important. Now we need to continue educating people who should be tested. We need to educate other physicians—not just oncologists, but family practice doctors and internists because they testing. Those guidelines are out there. We just see people who need need to inform [these healthcare professionals]. What is your advice for other healthcare professionals on how to broach the topic of genetic testing with their patients? The first time you see them, take their complete family history. When you see your patient again, ask whether there have been any changes [in the family history]. Has anyone in their family been diagnosed with a cancer since you last spoke to them? Is there an optimal testing method? There are a number of testing platforms out there now. There are a lot of different companies that all have certified and validated testing platforms. There are also some testing platforms that [evaluate] ancestry. They are available even in the drugstore. Those can be a good start, but they’re not validated. We have to be really careful about making any treatment recommendations or “raising the alarm bells” if those things come back abnormal. They’re really just a screening tool. If those come back abnormal, then patients should go on to receive comprehensive genetic testing. What genes beyond BRCA are being investigated? There are a number of different genes besides BRCA that we need to be aware of. There is an entire panel. On the common hereditary cancer panel, there are 53 genes for the ones that we use. Some of them we talk about in terms of syndromes, such as Lynch syndrome. There is an entire list of genes that are specific for ovarian cancer, including PALB2, BRIP1, and STK11. There are a number of other mutations. The companies that do this testing have an ongoing algorithm where they look to see what is pathogenic or deleterious and what’s not. It continues to change. What do we know about patients with homologous recombination deficiency (HRD)? HRD is really an issue with how DNA repair happens in cells. When double-stranded DNA breaks happen as cells divide, we usually have 2 different pathways to repair those DNA breaks. In [HRD-positive tumors], which are usually BRCA-related, one pathway doesn’t work at all. Therefore, we focus on the other pathway that uses PARP. If we can inhibit PARP with a PARP inhibitor, then we knock out both ways to repair the cell and the cell dies. That’s why PARP inhibitors can be useful across the board, but especially so in patients who have already lost the ability to repair those breaks. What are some common misconceptions about genetic testing? A lot of people are scared of genetic testing. They think that once they know they have this gene that they have a death sentence. It’s actually quite the opposite. Once people know that they have a gene that could put them at risk for getting ovarian or breast cancer, we can intervene before that ever happens. That is huge. People are scared, and it’s through education that we’re going to be able to help people understand that it’s useful information to know. Are there any ongoing trials incorporating the use of genetic testing? Absolutely. There are a number of trials that look at genetic test- ing and what we do with patients who have these mutations. One thing that is at the forefront is whether we can take out [a pa- tient’s] tubes and leave the ovaries. This can be very useful for young patients with hereditary mutations. It would allow them to keep their ovaries, their hormone function, and take away the cancer risk from the tubes. Is genetic testing valuable for patients with other gynecologic malignancies? Yes. Especially in uterine cancers, we know that a proportion of uterine cancers are related to inherited mutations. We can detect those mutations and prevent uterine, ovarian, colon, and breast cancers in those patients.